HAPPY ANNIVERSARY TO THE ISRAEL PHILHARMONIC ORCHESTRA AND ZUBIN MEHTA! | Kirshbaum Associates Inc. HAPPY ANNIVERSARY TO THE ISRAEL PHILHARMONIC ORCHESTRA AND ZUBIN MEHTA! Celebrating the concurrent 75th anniversaries of both the Israel Philharmonic Orchestra's and Music Director Zubin Mehta's birth years, as well as the 50th anniversary of Maestro Mehta's conducting debut with the same ensemble, the Orchestra proudly announces its 2011 United States tour, performing eight concerts in seven cities February 19-March 1, 2011. As a 75-year old symbol of cultural diplomacy, the Israel Philharmonic Orchestra brings its music and message of peace to concerts in Naples, West Palm Beach, New York City, Newark, Seattle, San Francisco and Los Angeles. Mehta and the IPO bring no less than five separate programs to these cities, performing works by Beethoven, Haydn, Liszt, Mahler, Schubert and Webern. Full program information is available below. The Israel Philharmonic Orchestra's Carnegie Hall program offers two additional features unique to the New York City performance: Grammy Award-winning pianist Yefim Bronfman joins the Orchestra in Liszt's Piano Concerto No. 2 in A major; and to celebrate the IPO's role as an ambassador of cultural communication between Israel and the rest of the world, the Orchestra performs the North American Premiere of a new orchestral version of Israeli composer Avner Dorman's Azerbaijani Dance. Known as the "Heartbeat of a Nation," the Israel Philharmonic Orchestra stands as a powerful symbol of freedom and peace in its role as cultural emissary for the State of Israel. Since its inception in 1936, the IPO (originally named the Palestine Orchestra) has been dedicated to presenting the world's greatest classical music to audiences in Israel and worldwide. The Orchestra tours as an international emissary for Israel, serving as an exponent of cultural diplomacy for the nation while upholding its reputation as an integral part of the international music scene. The Israel Philharmonic Orchestra could not celebrate its 75th Anniversary without recognizing the extraordinary achievements Maestro Zubin Mehta has made both as the IPO's Music Director, and as one of the world's preeminent musical leaders. During these 50 years since Maestro Mehta's conducting debut with the IPO, he has remained not only a great friend of the IPO and the State of Israel, but has also become one of the most sought-after conductors in the world. 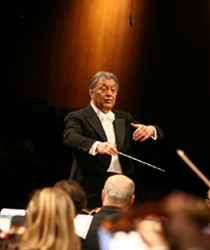 In addition to his title as Music Director for Life of the IPO, Mehta has held the post of Music Director for Montreal Symphony, Los Angeles Philharmonic and Bavarian State Opera and New York Philharmonic-for which, at 13 years, he remains the organization's longest-serving Music Director, conducting over one thousand concerts. He was also made an Honorary Member of the New York Philharmonic, an homage formerly bestowed on Wagner, Liszt, Dvorak, Copland, and Bernstein, among others. In addition to his active career and multiple music directorships, Zubin Mehta has maintained a strong commitment to exposing today's youth to classical music. He founded the Mehli Mehta Music Foundation in his birthplace of Mumbai, where more than 300 children annually find access to Western Classical Music. The Buchmann-Mehta School of Music in Tel Aviv educates young talents in Israel and is closely related to the Israel Philharmonic Orchestra, as is a project of teaching young Arab-Israelis in the cities of Shwaram and Nazareth, in conjunction with local teachers and members of the Israel Philharmonic Orchestra. Maestro Mehta has conducted over two thousand concerts as Music Director of the Israel Philharmonic Orchestra, including multiple tours spanning five continents. In 2006 Zubin Mehta was recognized for his extraordinary artistic achievements as a Kennedy Center Honoree. For Maestro Mehta the evening held an extra tribute as world-renowned violinist Pinchas Zukerman and members of the Israel Philharmonic Orchestra surprised their conductor by secretly traveling to Washington to perform in his honor. To ensure the financial future of the IPO, the American Friends of the Israel Philharmonic Orchestra will host Gala events in Palm Beach, New York City, San Francisco and Los Angeles. The Palm Beach Benefit Co-Chairs are Sara and Charles Fabrikant, Laurie Silvers and Mitchell Rubenstein and Robbi and Bruce Toll. New York City Benefit Co-Chairmen are Terre Blair & Marvin Hamlisch and Lauren & John Veronis. Benefit Co-Chairmen in San Francisco are Tracy and Dennis Albers, Doris and Rick Davis, Maribelle and Stephen Leavitt, Susan and Moses Libitsky, Varda and Irving Rabin, Lydia and Douglas Shorenstein and Eta and Sass Somekh. Los Angeles Co-Chairmen are Edythe and Eli Broad and Richard Ziman. All proceeds from the American Friends of the Israel Philharmonic Orchestra Benefit concerts help ensure the financial security of the IPO. Grammy-award winning pianist Yefim ("Fima") Bronfman has wowed critics and audiences worldwide with his solo recitals, prestigious orchestral engagements, and expanding catalogue of recordings, being especially admired for his performances of modern Russian repertory. Bronfman's 2010-2011 US season highlights include performances with the orchestras of Houston, Cincinnati, St. Louis, Atlanta, New York and Los Angeles. Beyond the US, he will perform with Europe's most celebrated orchestras, including the Concertgebouw, the Berlin Philhjarmonic, Vienna Philharmonic, the Israel Philharmonic Orchestra and Berlin Staatskapelle, among others. In the fall, Bronfman and long-time friend and collaborator Pinchas Zukerman tour the US in a duo recital, with concerts in Chicago, Kansas City, Boston and New York's Carnegie Hall. Having trained at the Juilliard School, Marlboro, and the Curtis Institute, with Rudolf Firkusny, Leon Fleisher, and Rudolf Serkin, Bronfman was awarded the prestigious Avery Fisher Prize in 1991. HAYDN: Symphony No. 96 in D major "The Miracle"
SCHUBERT: Symphony No. 9 in C major "The Great"
North American Premiere of a new orchestral version of Israeli composer Avner Dorman's Azerbaijani Dance.